As a top rated Bali Dental Clinic - Who Are We? Awesome aesthetics, the height of hygiene, Diamond star Dental care for all-around dentistry is what our Bali Dental Clinic is about. We are now well established and are loved by so many here in Bali and by travellers from all over the globe. In fact we are becoming so popular that we are expanding yet again with more dental specialists at our Kuta branch and we are pleased to announce the launching of our new branch in Sanur ..Soon. At our Kuta branch our dental patients love that we have an anti-aging center right next door since we have the benefits not only of our super special oral Doctors but also a myriad of aesthetic / anti aging medical professionals too. The real question is, how do you know if what we say about our quality service is true? Anyone can blow their own horn, yes?. What could possibly be any different from one dentist to the next? It's a fair question and one that requires an answer. But hey, don’t ask us, we could be a little partial right?. Best to come and take a peak inside our clinic and check it out for yourself. ​If you are at all nervous about going to the dentist, we understand it can be a daunting and frightening prospect, but fear not, by the time you have finished speaking with our caring gentle professionals you will be relaxed and at ease ready for any procedure. We walk you through and explain the exact steps in detail so there are no surprises. 1. Team Work: We are a dedicated professional team at your service. We have an extended aesthetic anti-aging center at the same location... we will give you the benefit of their expertise too. We are a dedicated Team looking out for your best interests. 2. At the Bali Cosmetic Dentist you are treated differently. We consider the whole picture... your health and safety, your aesthetic appearance, your peace of mind, your education and your stress free healing. 3. Safe Hands: We are gentle and caring and can treat all ages from teething toddlers, trending teenagers to aging elders. At any age and any condition, you are in safe hands. ​4. Service: In short, personlised service. It is very important for us to get to know you. The intention is to develop a partnership and together design a perfect oral health plan based on your current oral health conditions together with your ultimate smile goals. This of course obligates us to educate you on particular diseases, all the treatment options available and then implementing the treatment plan that deals with your particular needs and that you are totally comfortable with. 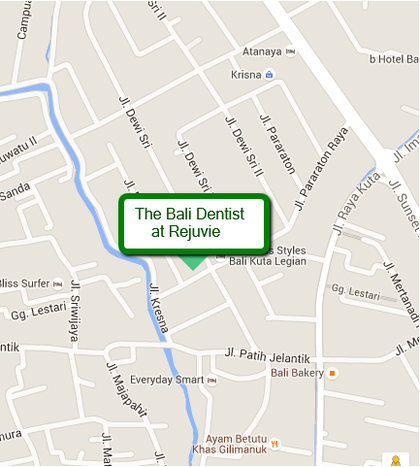 The Bali Dental Practice - Located At Rejuvie anti-aging Clinic. or by tourists as the Kuta-Bali-Dentist @Rejuvie, because of its central location, easy access by most of the major hotels in the area and of course its convenient proximity and relationship with the Rejuvie anti-aging clinic. Residence Condotel and just opposite the Grand Livio Kuta Hotel. 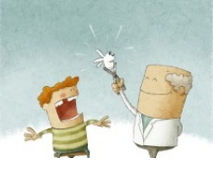 Q: ​How To Choose the best Dentist in Bali? Ans: Pick any 2 Dentists offering the same procedures who have similar Dental skills with identical medical qualifications and knowledge of human teeth,,, Which One is the best? The best Dentist is the one who cares about YOU, NOT his wallet. The one that communicates and empathises with your particular situation. Helping you to understand how and why your condition came about or how they are going to achieve your particular aesthetic goals. ​The best Dental specialist will put you completely at ease with his / her confidence, letting you know what is about to happen before it happens so there are no surprises. No Stress, No Surprises! Welcome To The Bali: Cosmetic Dentist; Aesthetic Dentist; Regular Dentist; Orthodontics Dentist - The one stop Teeth Care Dental Bali Clinic. Located in the main central area of Kuta, our Dental Bali clinic is ready to meet all your dental needs from general dentistry to orthodontics to full aesthetic dentistry. This is not the usual High street dentist ready to pull a tooth at the snap of enamel, we are professionals, highly trained fully licensed, fully qualified, who care for your health, how you feel and how your smile makes you look good. Our attention to detail is sometimes annoying but we want only the best outcome for you... Since your beaming smile is a permanent testimonial. ​Be prepared to be nurtured by our dedicated team of Dental nurses. You will have full knowledge of 'what's going on' with full information and details of the dental procedures to be performed so that you can actually relax with peace of mind knowing that your 'Pearly Whites' are in the safe hands. 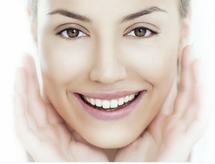 We are committed to recommending the best and most relevant procedures for your health and aesthetic needs. We use the most up to date and advanced dental equipment on the market together with the best 'medical grade' products in the Dental care industry. Let us help you have a healthy winning smile. ​It is becoming well known overseas that teeth care in Bali is improving in quality. Expats from all over the world search for 'Expat Dental Care' when in their own country to plan a Bali Dental Holiday, so they can enjoy not only a hoiday here in Bali but also the cheaper dental prices compared with their own country. Most of the dentist clients are looking for cosmetic dentistry in Bali and are expats either visiting or living in Bali. ​While there are several good dentists in Bali island the 2 oldest clinics and the ones with the most dentist reviews are the Bali dentists, dr Rudy and Bali 911. However our Kuta Dentist experts are now getting a good reputation as another quality alternative. There is also the Bali International dental centre. For this clinic Check out the Dr. Sucipto website. Guess what? Most people won't know that it was barbers, yes male hair dressers, who were the first to carry out dental work. This was in the late 1300s and it was the French barber Ambroise Pare, also known as the Father of Surgery who wrote and published his works on practices for maintenance and treatment of teeth. He was known as the most famous of barber-surgeons as they were called in those days and was recognised as being responsible for raising both the standards of dentistry work and the status symbol of barber-surgeons! !